Here we see Buffalo Bills kicker Dan Carpenter doing his best impression of a Bills fan tailgating. This is a Deadspin Video, in which strange sports moments are slowed down to ridiculous speeds and matched with indie music. 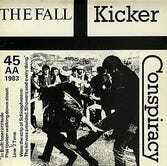 This video features “Kicker Conspiracy” by The Fall. See previous episodes here. A Spotify playlist of every song used in Deadspin Videos can be accessed here.